One of the most important legal documents you may ever need is an advance directive, which outlines actions that you wish to be taken in case of your illness or incapacitation. Learn more about advance directives at 10:30 a.m. this Thursday, Aug. 9, at the Mesa County Libraries Central Library. This public presentation will explain what advance directives are and how to make them most effective. The presenter is Regina Fink, RN, Ph.D, an associate professor at the University of Colorado College of Nursing, where she teaches palliative care classes to master’s-level nursing students. A national and international lecturer on pain, palliative care, and evidence-based practices, she has focused her 38-year career on caring for persons with cancer and pain. This presentation is open to adults at no charge. Please preregister by calling 970-243-4442 or by visiting the online Events Calendar. 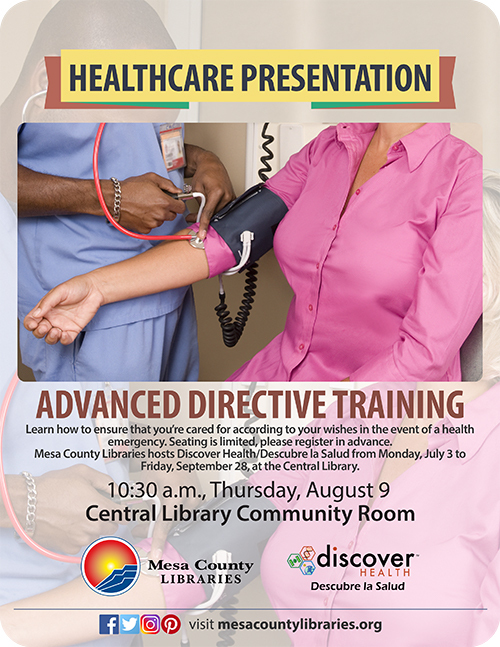 The advance directive training is co-hosted by Mesa County Libraries and the Western Colorado Area Health Education Center as part of the “Discover Health/Descubre la Salud” traveling exhibit on display at the Central Library through Sept. 28. The display is set up throughout the Central Library and consists of bilingual information panels, interactive anatomical models, and computer-based interactives. The displays make learning about health fun and interesting for people of all ages. Stop by and see for yourself!